Comments: ‘Walking Away’ cuts in and ‘Take A Look Around’ cuts out due to empty batteryt. Great shot. Comments: Screenshot nearly all the time. Comments: Uploaded on YouTube. ‘My Generation’, ‘My Way’, ‘Rollin’, ‘Take A Look Around’ and ‘Faith’ mixed with pre-show and other footage from the show. – ‘9 Teen 90 Nine’ and ‘Walking Away’ reappeared for this show. It was also the first time since the Frankfurt show that Fred screamed the last chorus completely. – A short guitar intro to ‘It’ll Be OK’ was played by Wes. – Fred picked a fan up on stage for ‘My Way’. – While Wes played the ‘Break Stuff’ riff before the first verse, Fred took a bottle of Vodka and ordered all the other band members to drink from it, starting with Sam, continuing with DJ Lethal, John, Wes and then himself. 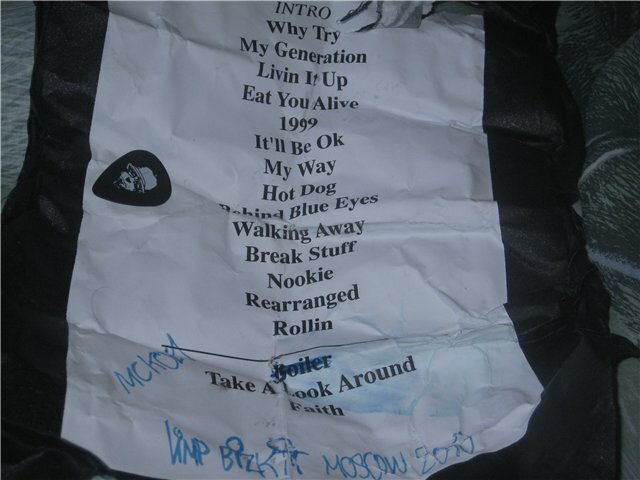 – ‘Boiler’ was on the setlist to start the encore, but has been dropped during the show.